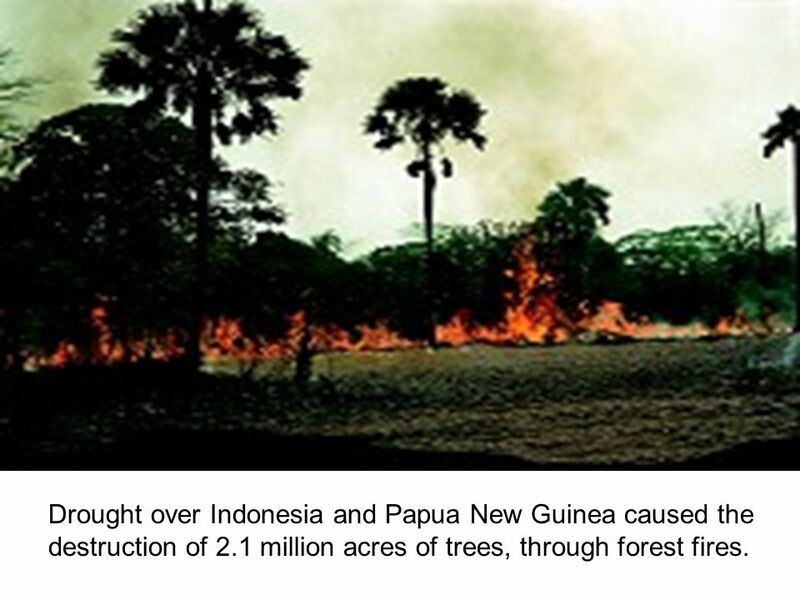 8 Drought over Indonesia and Papua New Guinea caused the destruction of 2.1 million acres of trees, through forest fires. 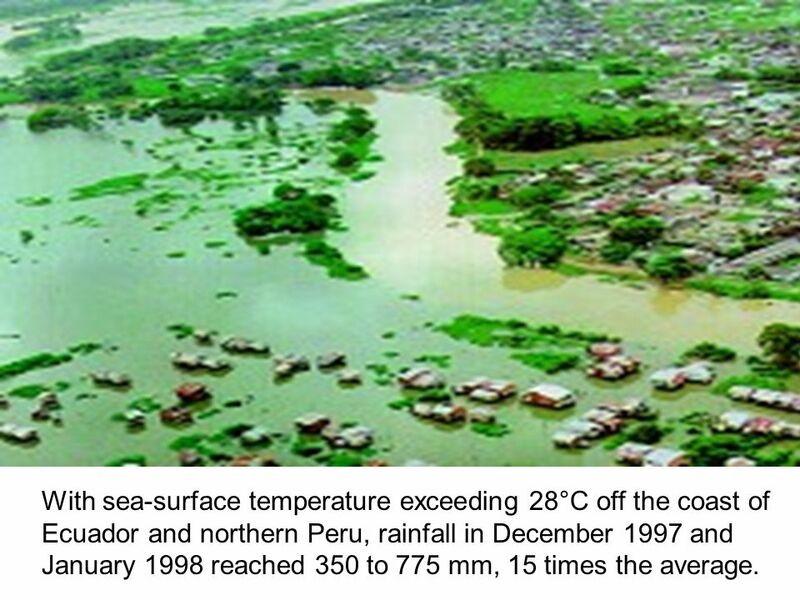 10 With sea-surface temperature exceeding 28°C off the coast of Ecuador and northern Peru, rainfall in December 1997 and January 1998 reached 350 to 775 mm, 15 times the average. 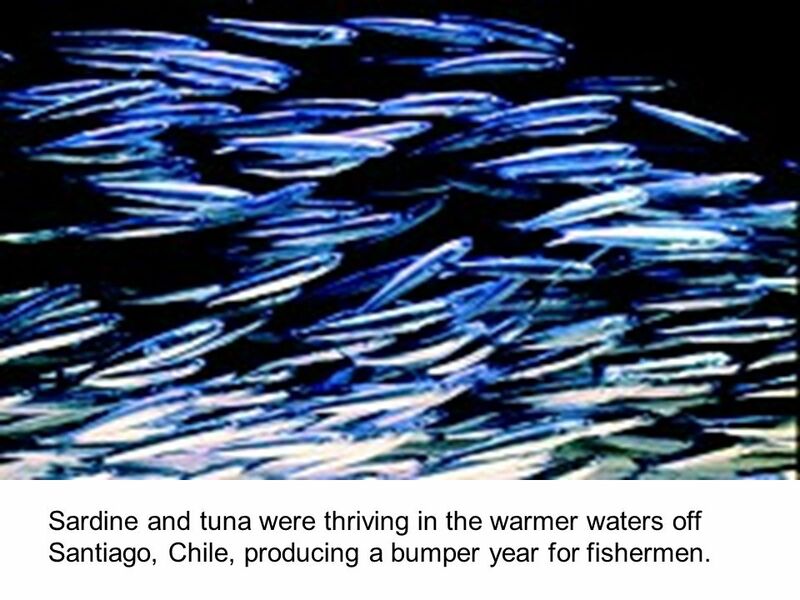 12 Sardine and tuna were thriving in the warmer waters off Santiago, Chile, producing a bumper year for fishermen. 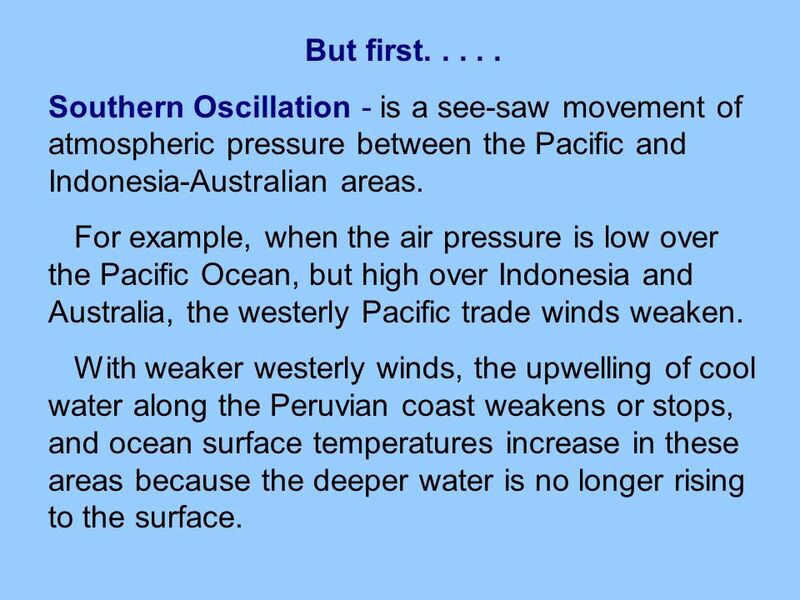 18 But first Southern Oscillation - is a see-saw movement of atmospheric pressure between the Pacific and Indonesia-Australian areas. 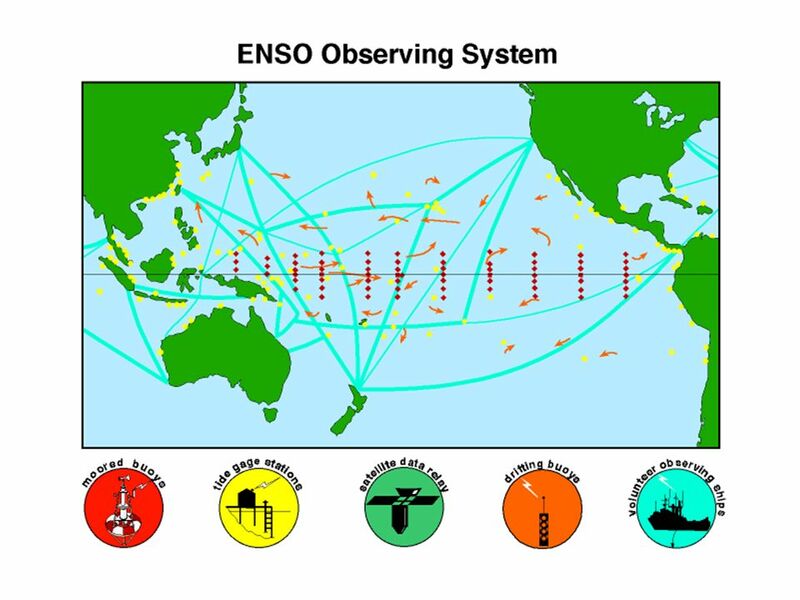 For example, when the air pressure is low over the Pacific Ocean, but high over Indonesia and Australia, the westerly Pacific trade winds weaken. 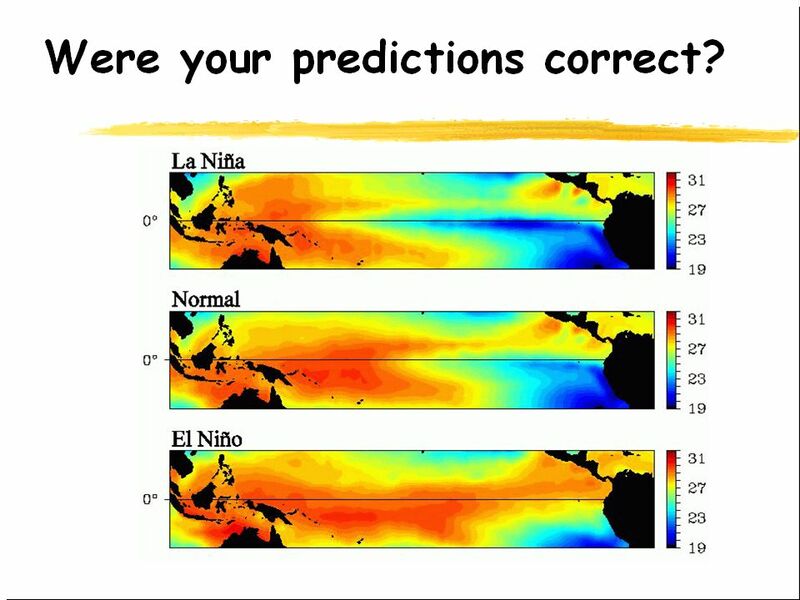 With weaker westerly winds, the upwelling of cool water along the Peruvian coast weakens or stops, and ocean surface temperatures increase in these areas because the deeper water is no longer rising to the surface. 19 Normal pattern The sea surface is higher in the west, in Asia, than in the east, along the coast of South America. 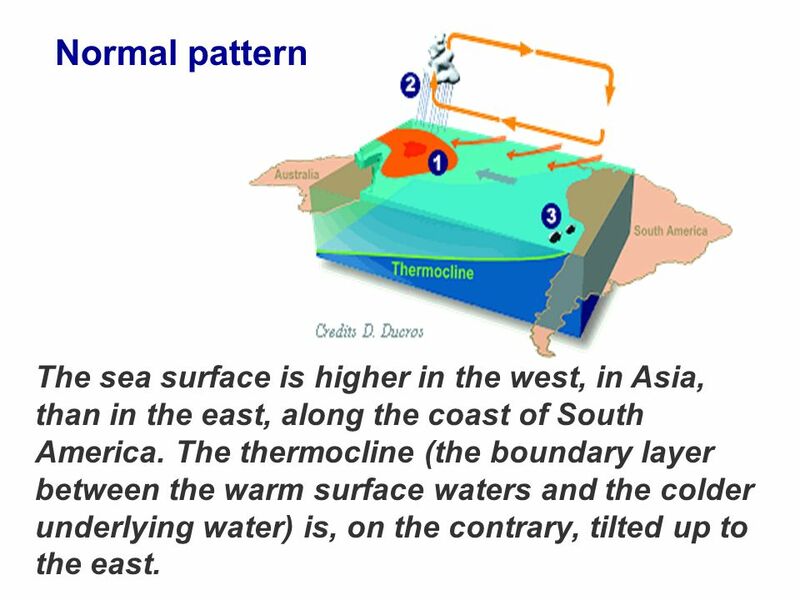 The thermocline (the boundary layer between the warm surface waters and the colder underlying water) is, on the contrary, tilted up to the east. 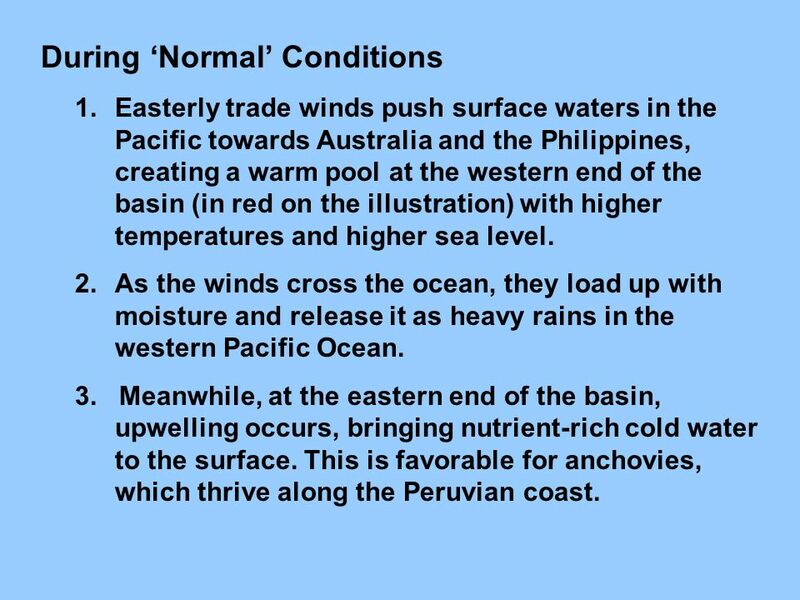 Easterly trade winds push surface waters in the Pacific towards Australia and the Philippines, creating a warm pool at the western end of the basin (in red on the illustration) with higher temperatures and higher sea level. As the winds cross the ocean, they load up with moisture and release it as heavy rains in the western Pacific Ocean. 3. Meanwhile, at the eastern end of the basin, upwelling occurs, bringing nutrient-rich cold water to the surface. 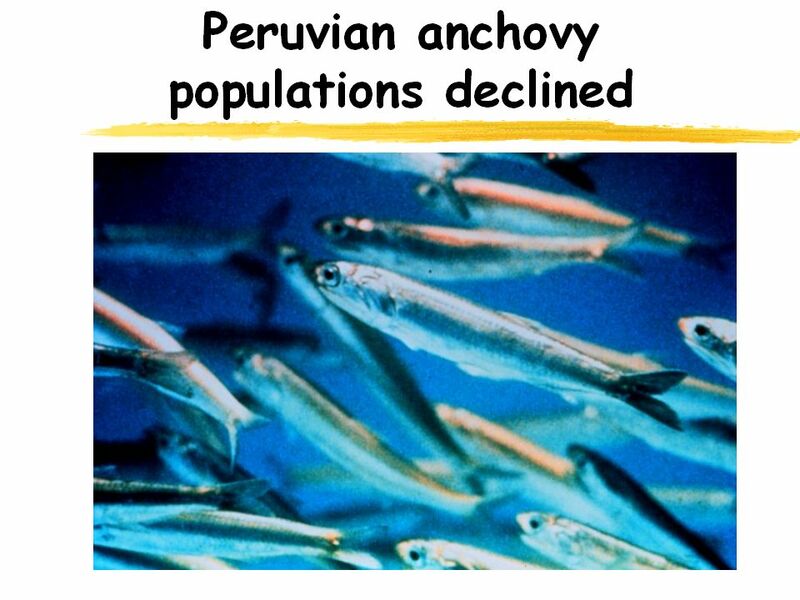 This is favorable for anchovies, which thrive along the Peruvian coast. 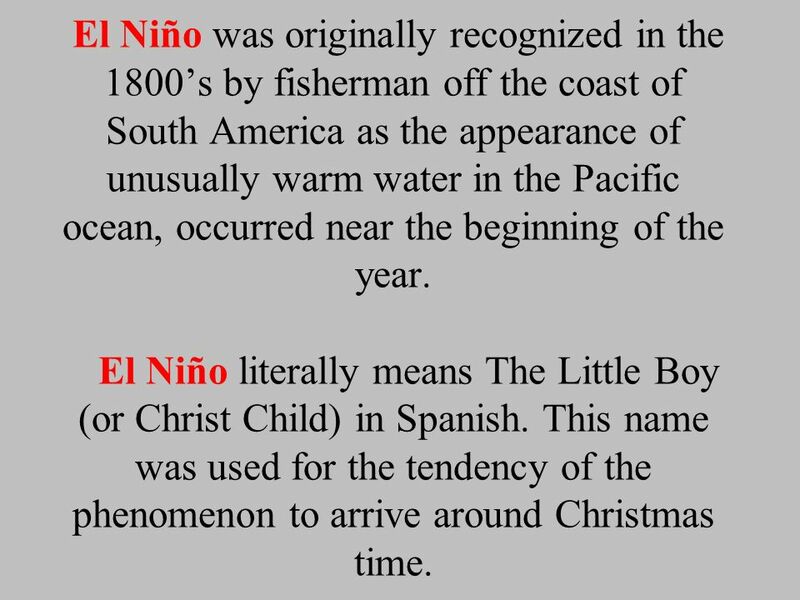 23 El Niño was originally recognized in the 1800’s by fisherman off the coast of South America as the appearance of unusually warm water in the Pacific ocean, occurred near the beginning of the year El Niño literally means The Little Boy (or Christ Child) in Spanish. 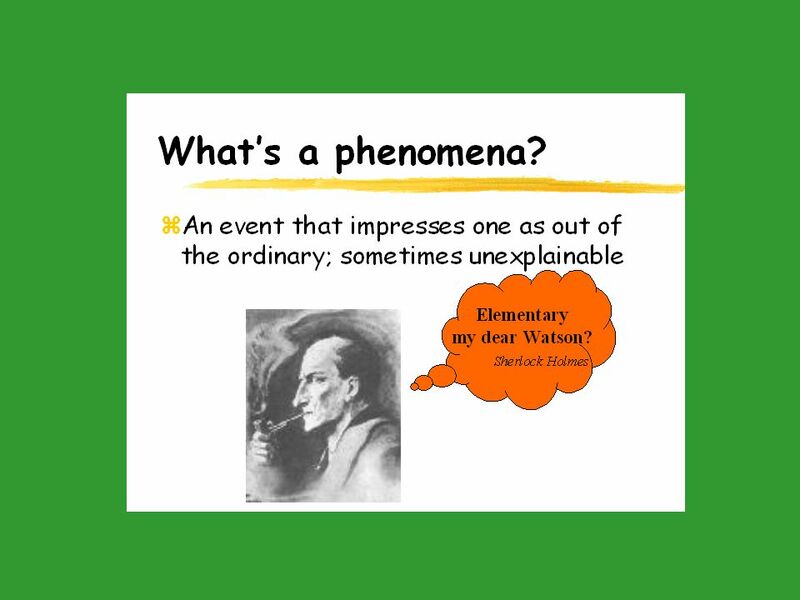 This name was used for the tendency of the phenomenon to arrive around Christmas time. 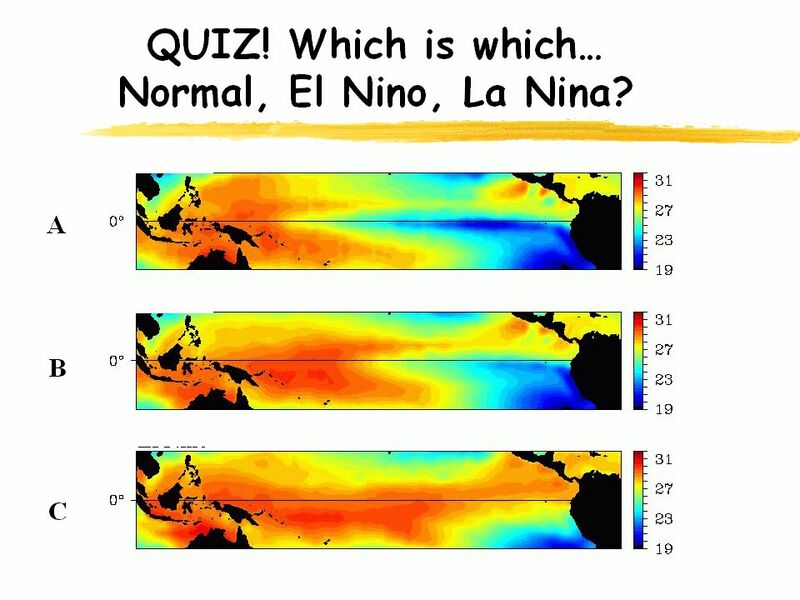 24 El Niño is a term originally used to describe the appearance of warm (surface) water from time to time in the eastern equatorial Pacific region along the coasts of Peru and Ecuador. 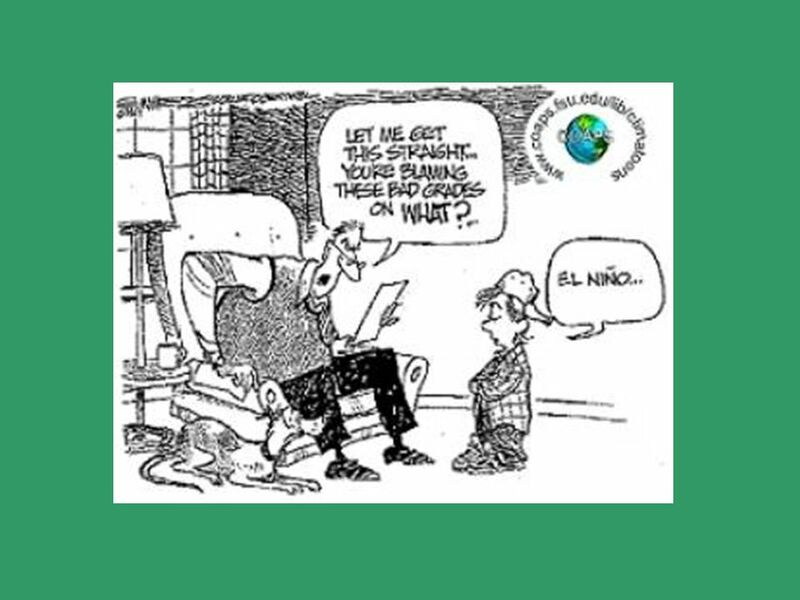 It was once suggested that minor El Niño events occurred about every two to three years and major ones about every eight to 11 years. 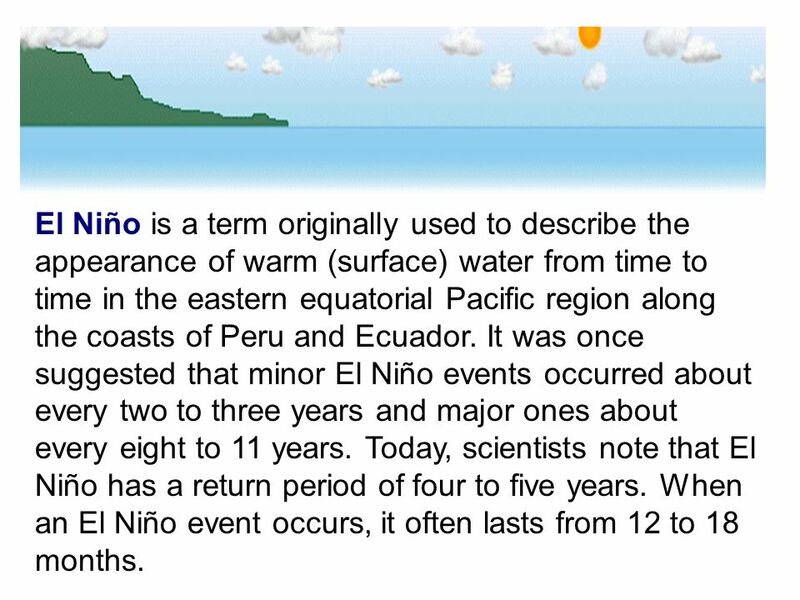 Today, scientists note that El Niño has a return period of four to five years. 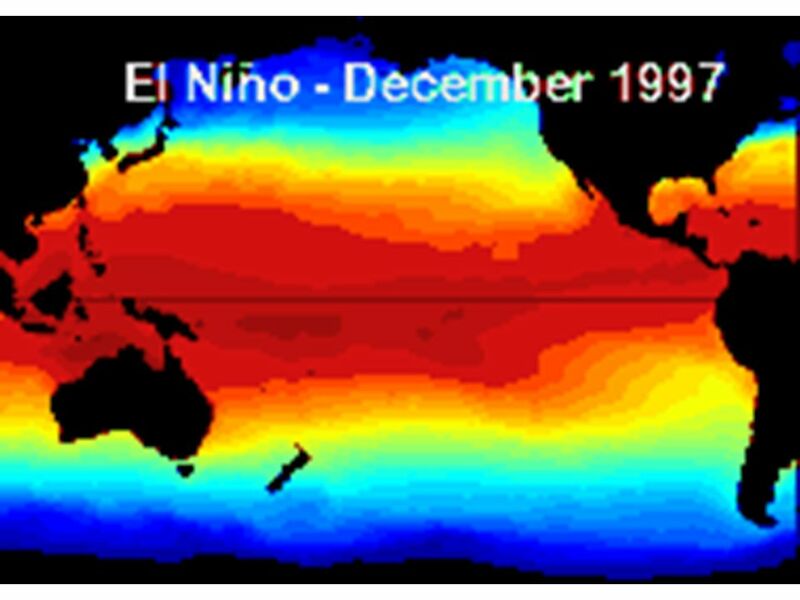 When an El Niño event occurs, it often lasts from 12 to 18 months. 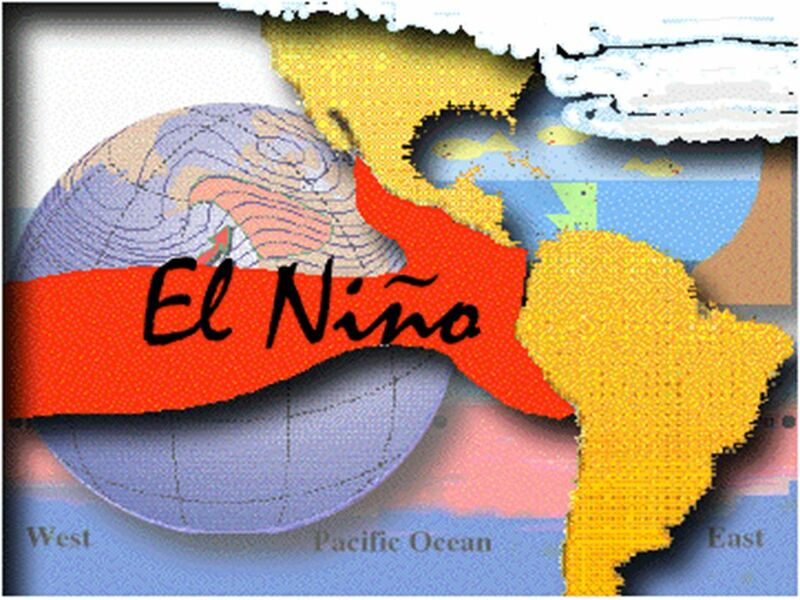 26 During El Nino Westerly wind bursts at the western end of the Pacific allow the warm water to drift eastward into the central Pacific. 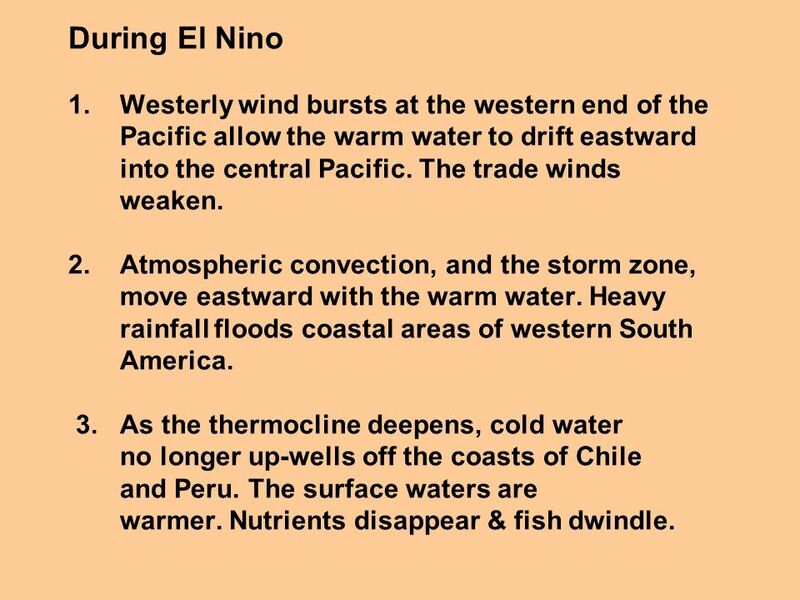 The trade winds weaken Atmospheric convection, and the storm zone, move eastward with the warm water. 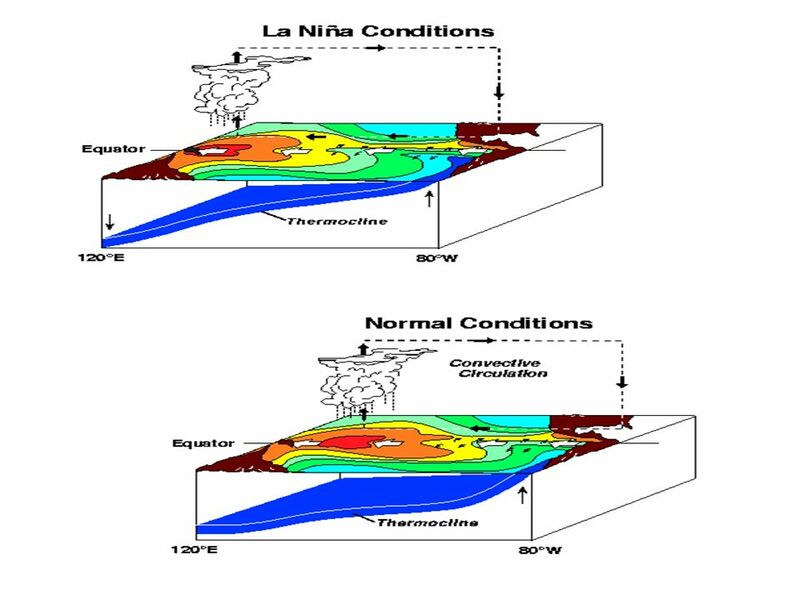 Heavy rainfall floods coastal areas of western South America As the thermocline deepens, cold water no longer up-wells off the coasts of Chile and Peru. 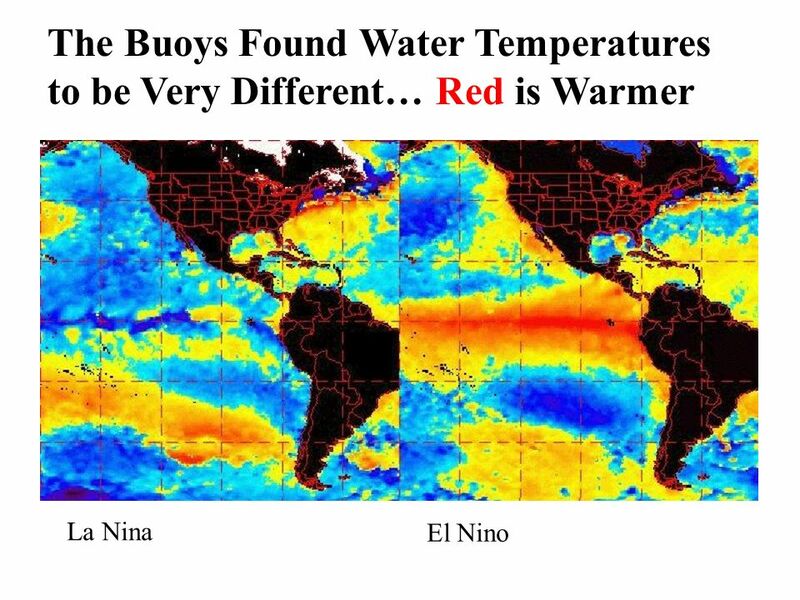 The surface waters are warmer. 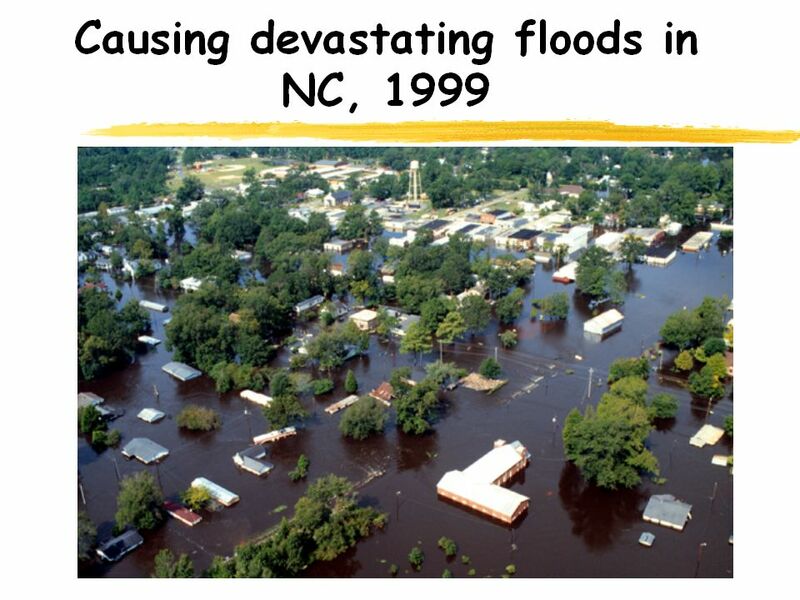 Nutrients disappear & fish dwindle. 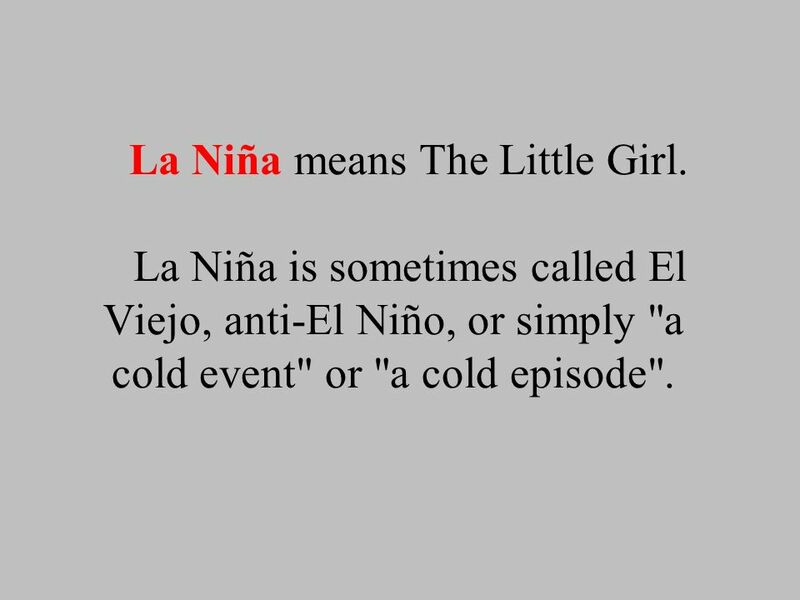 La Niña means The Little Girl La Niña is sometimes called El Viejo, anti-El Niño, or simply "a cold event" or "a cold episode". 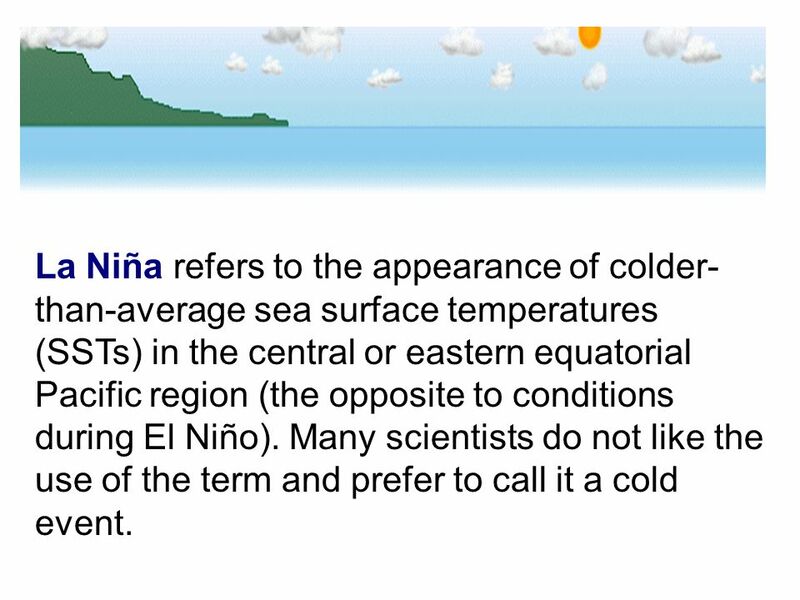 31 La Niña refers to the appearance of colder-than-average sea surface temperatures (SSTs) in the central or eastern equatorial Pacific region (the opposite to conditions during El Niño). 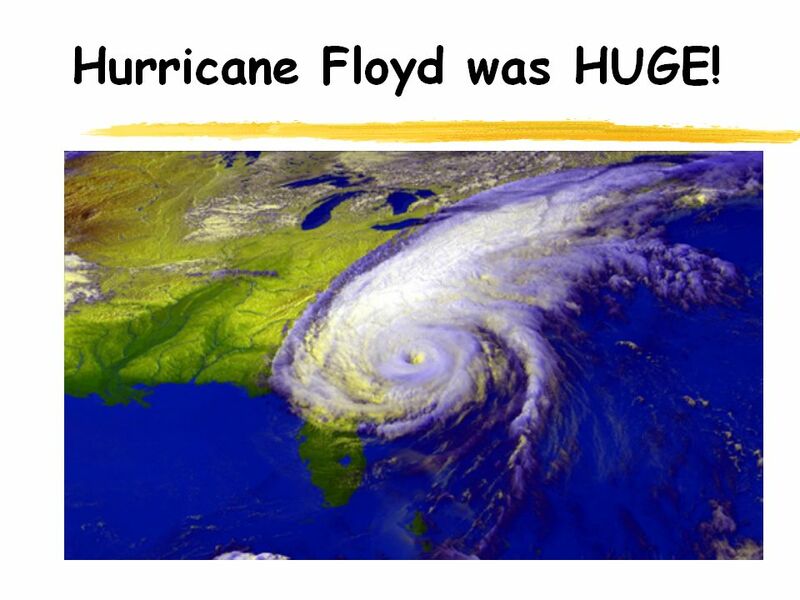 Many scientists do not like the use of the term and prefer to call it a cold event. 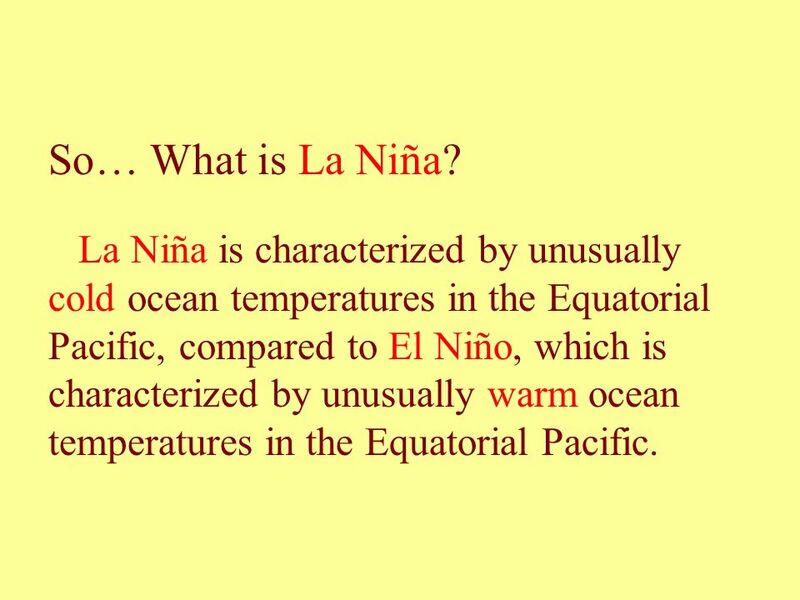 32 So… What is La Niña? 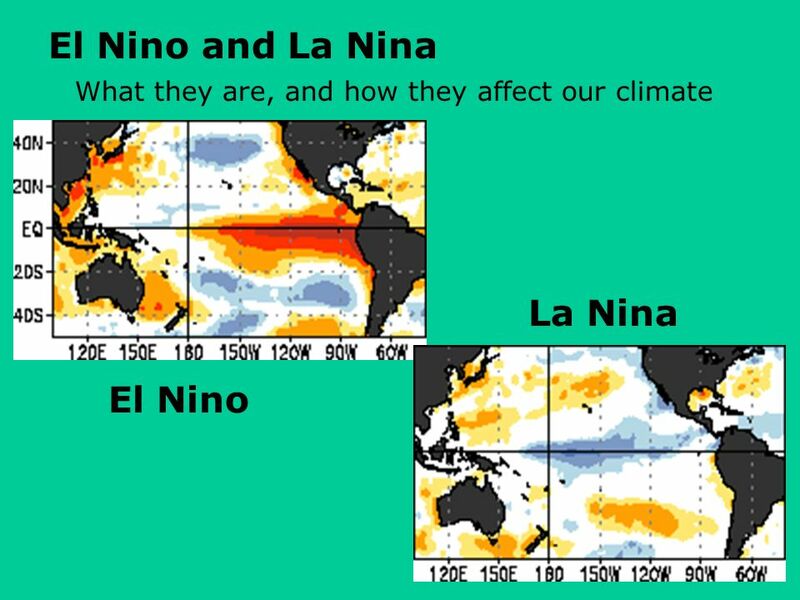 La Niña is characterized by unusually cold ocean temperatures in the Equatorial Pacific, compared to El Niño, which is characterized by unusually warm ocean temperatures in the Equatorial Pacific. 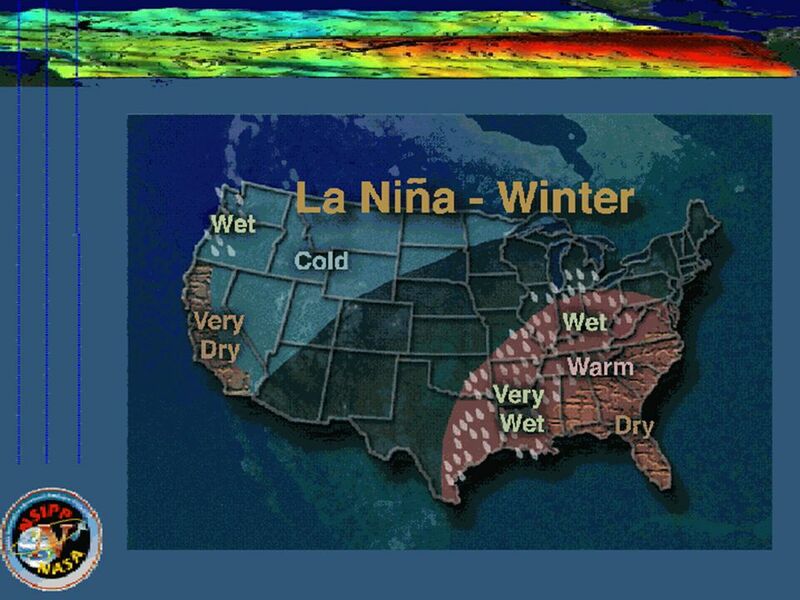 33 La Niña pattern Sea level tilt increases, rising more in the west and deepening in the east. 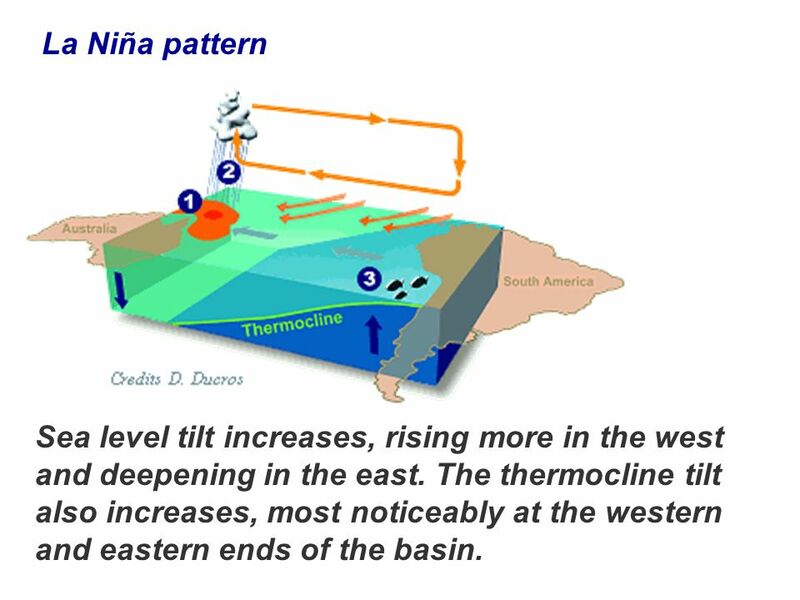 The thermocline tilt also increases, most noticeably at the western and eastern ends of the basin. 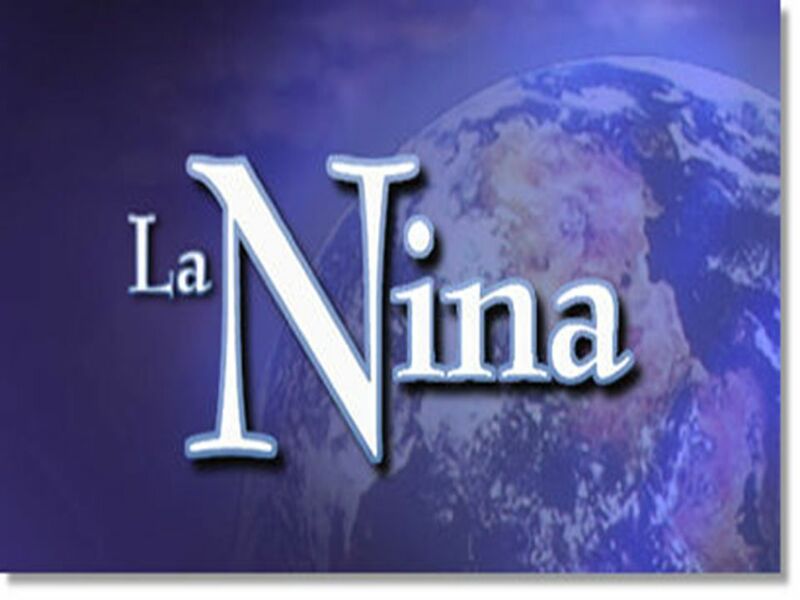 34 During La Nina 1. 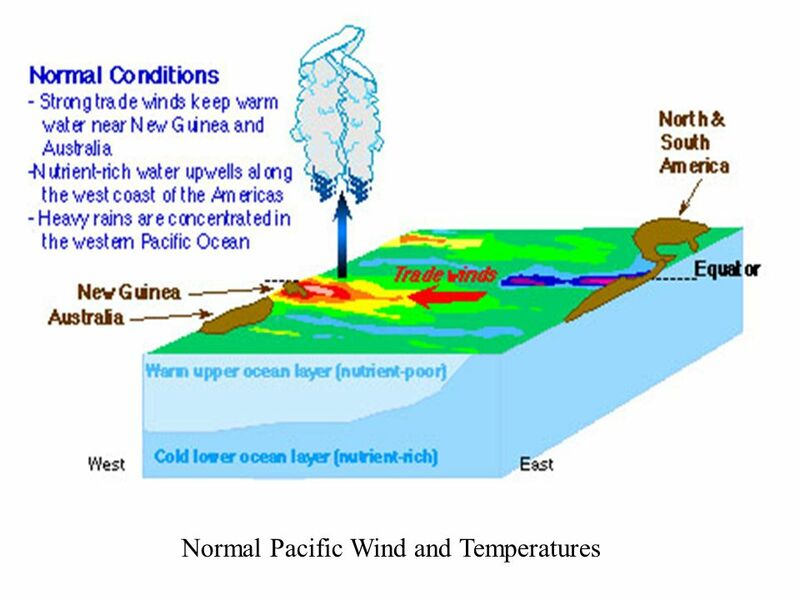 The trade winds strengthen, shrinking the warm pool and cooling the Tropical Pacific. 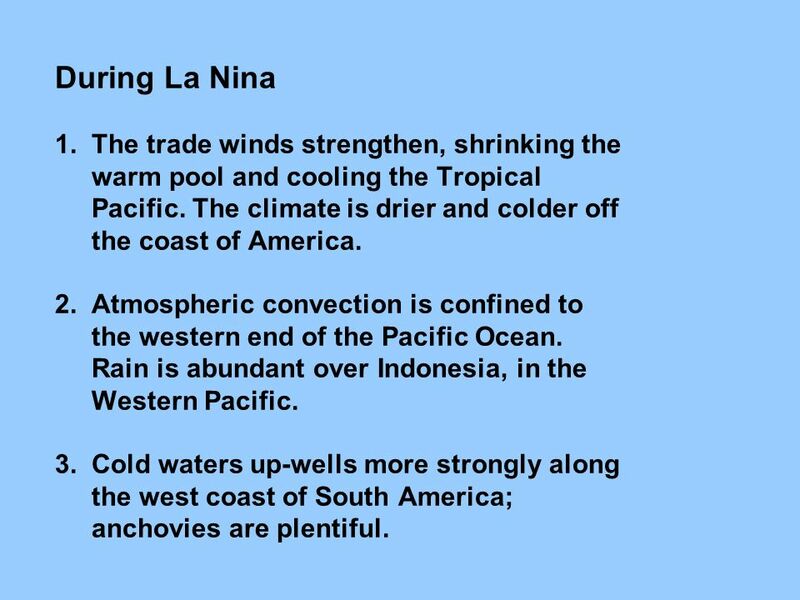 The climate is drier and colder off the coast of America Atmospheric convection is confined to the western end of the Pacific Ocean Rain is abundant over Indonesia, in the Western Pacific Cold waters up-wells more strongly along the west coast of South America; anchovies are plentiful. 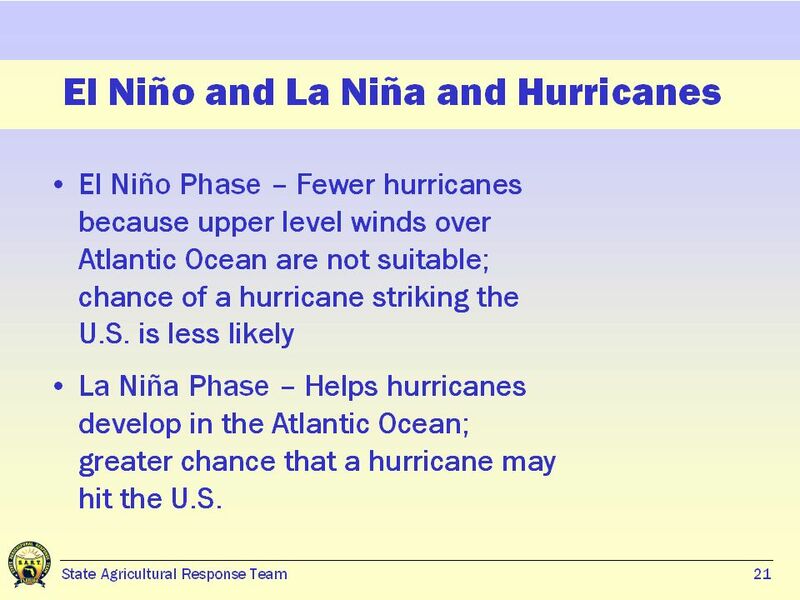 36 The strength of the El Nino/La Nina events, varies greatly from case to case. 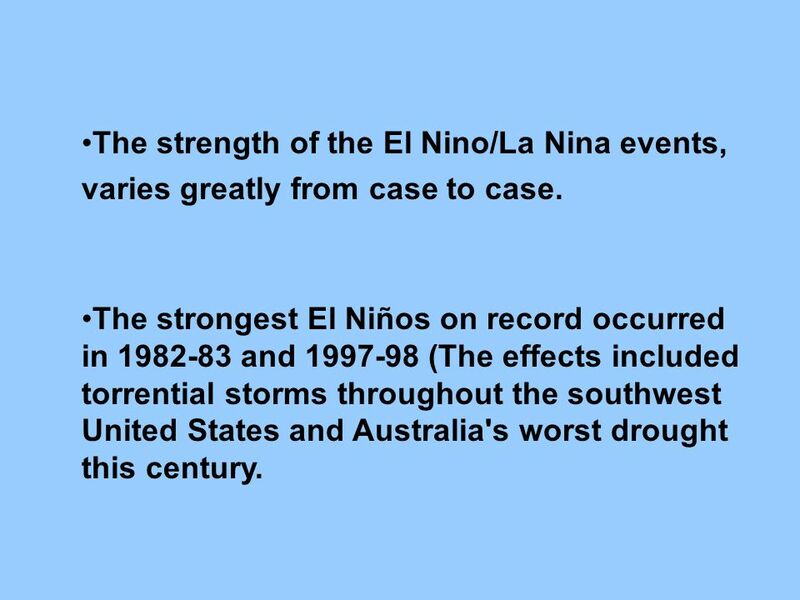 The strongest El Niños on record occurred in and (The effects included torrential storms throughout the southwest United States and Australia's worst drought this century. 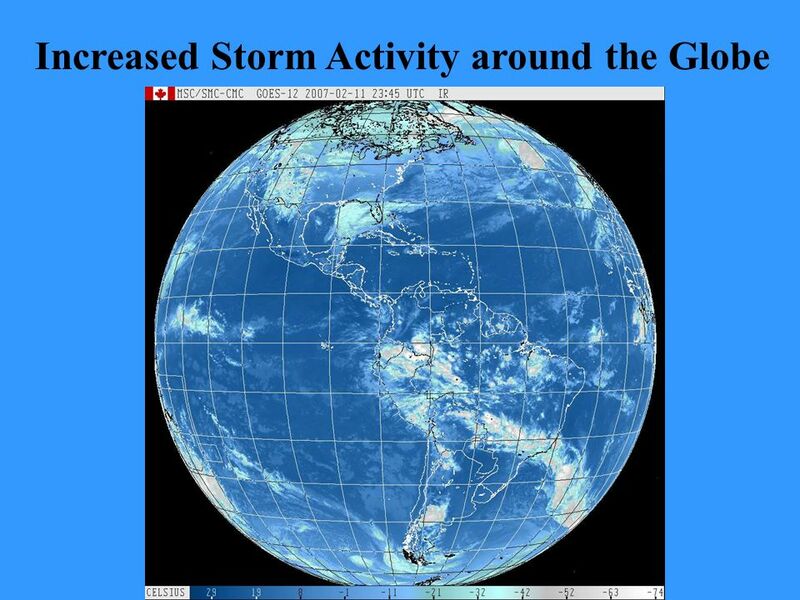 Download ppt "Increased Storm Activity around the Globe." 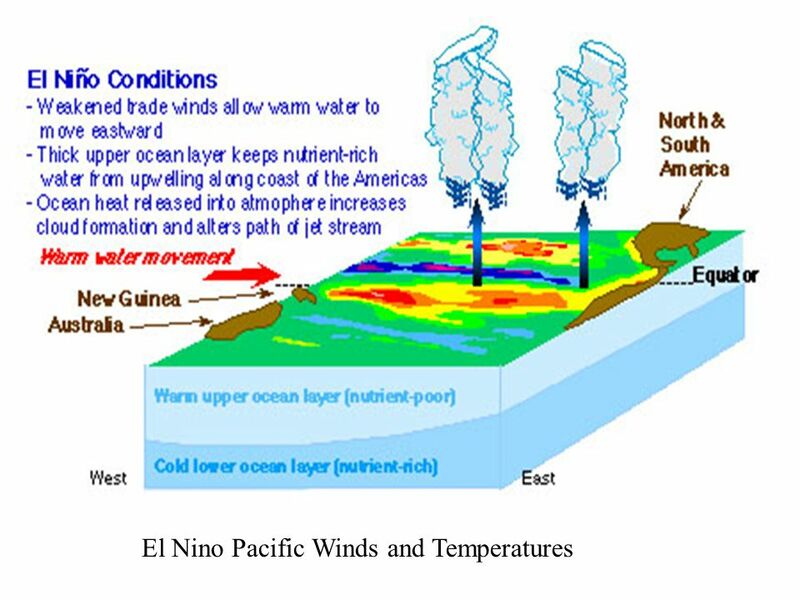 El Nino is a shift in ocean temperatures and atmospheric conditions in the tropical Pacific that disrupts weather around the world. It is a poorly understood. 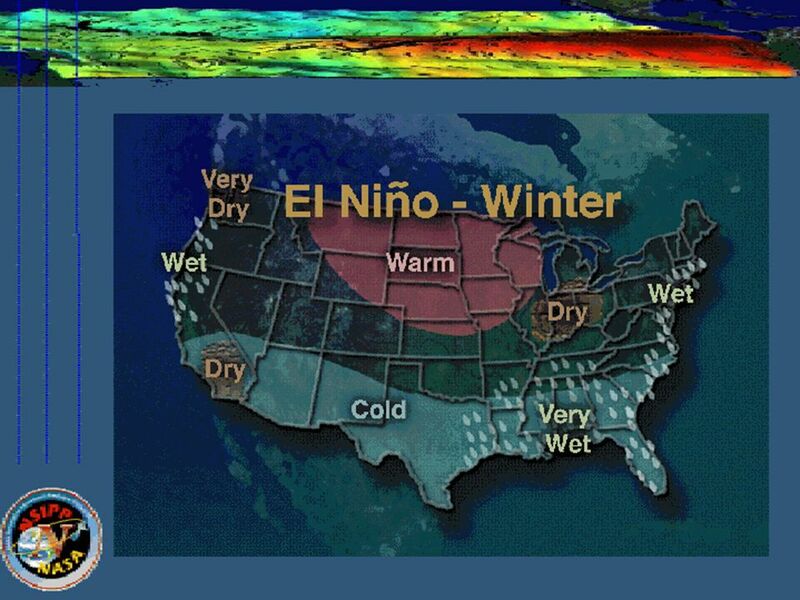 El Nino El Nino is hot air over hot water, which causes warm winds El Nino means boy in Spanish and it causes wet period in Midwestern US. 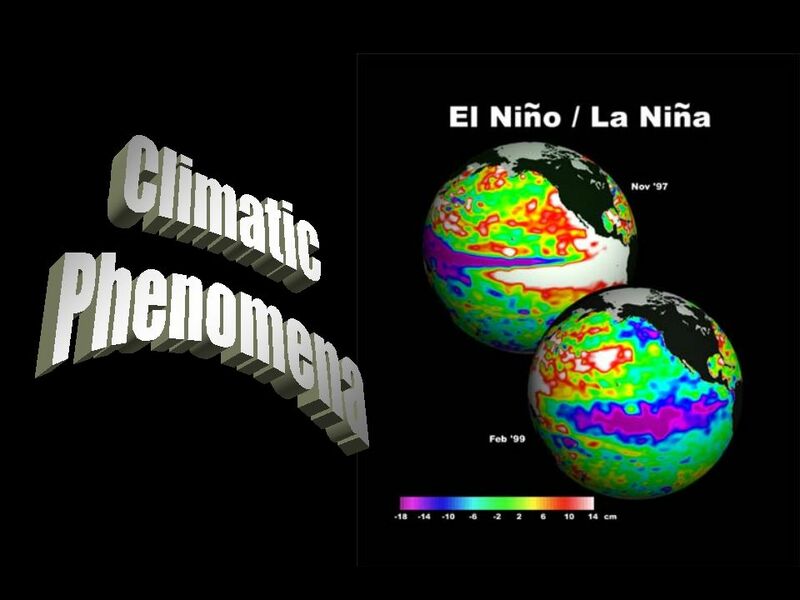 El Niño El Niño is a variation in the ocean and atmospheric temperatures in the Pacific Ocean. 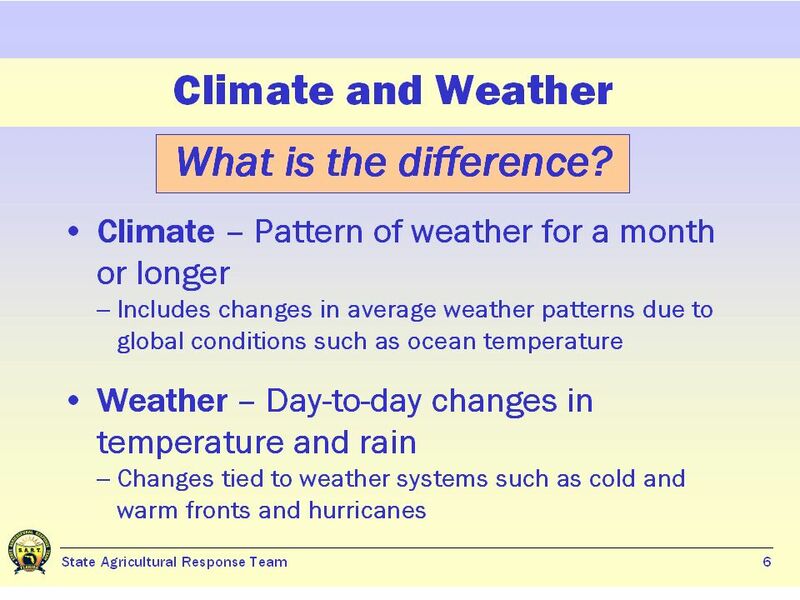 When the ocean temperature increases it causes ocean currents. 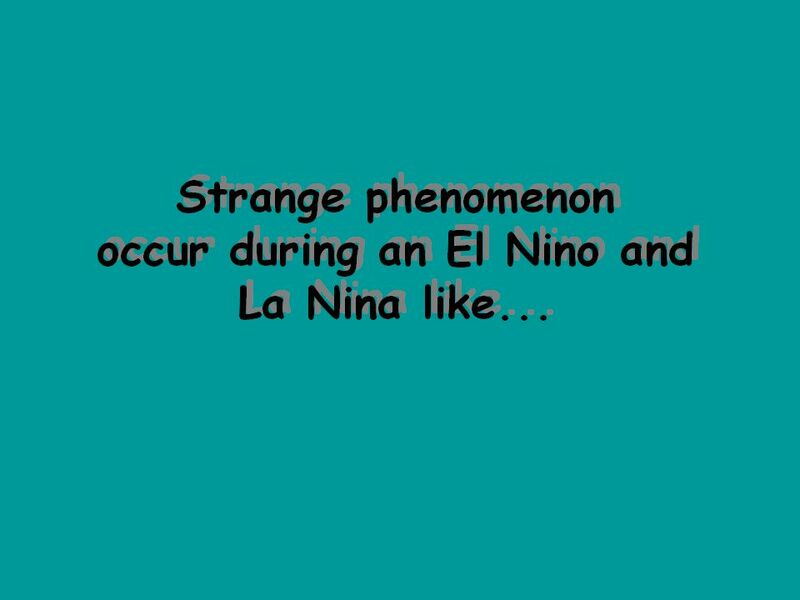 La Nina and El Nino Phenomena. 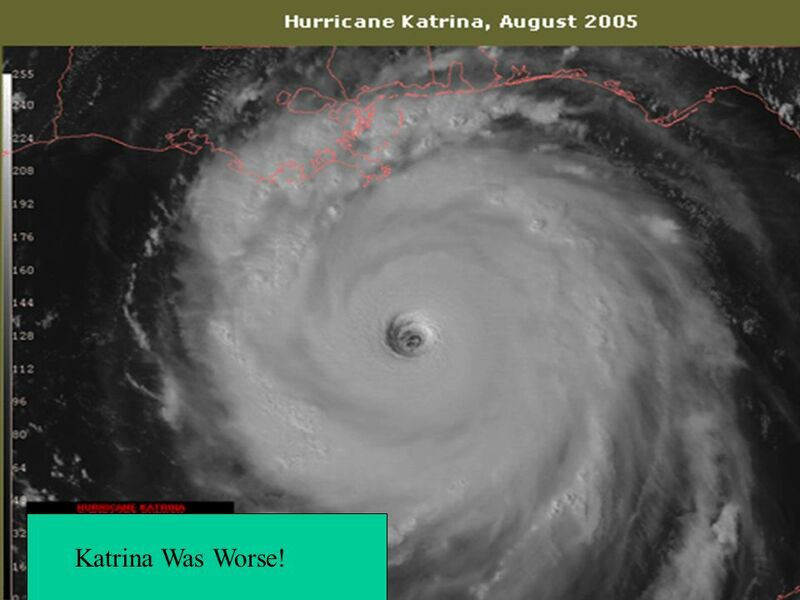 no.el.nino.cnn?iref=videosearchhttp://edition.cnn.com/video/#/video/weather/2009/07/27/byrnes.ctw.aregenti. 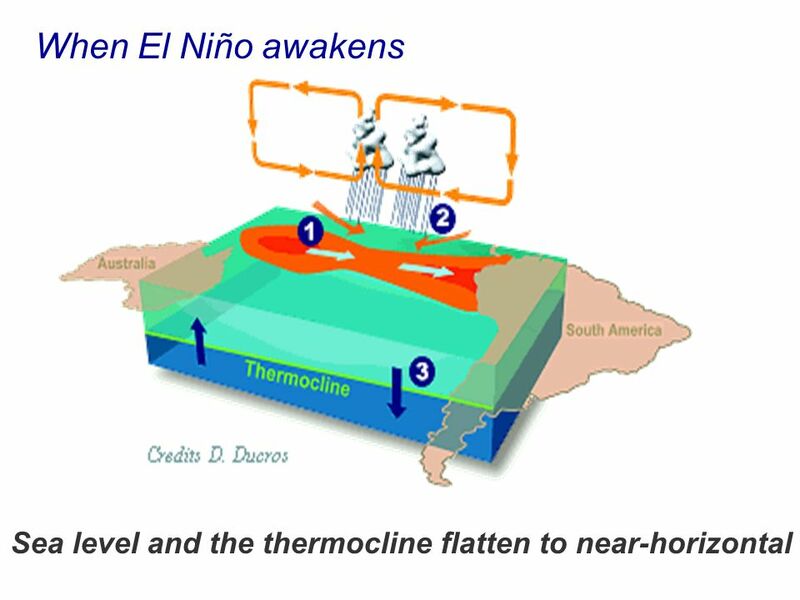 El Nino Refers to a weak, warm current appearing annually around Christmas time along the coast of Ecuador and Peru and lasting only a few weeks to a month. 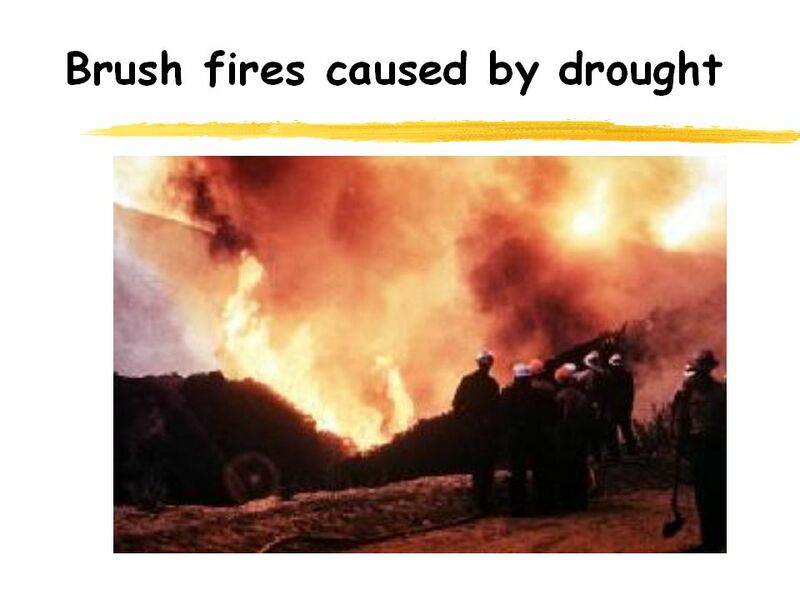 Outline Further Reading: Chapter 07 of the text book - terminology - characteristics of ENSO - impacts Natural Environments: The Atmosphere GE 101 – Spring. 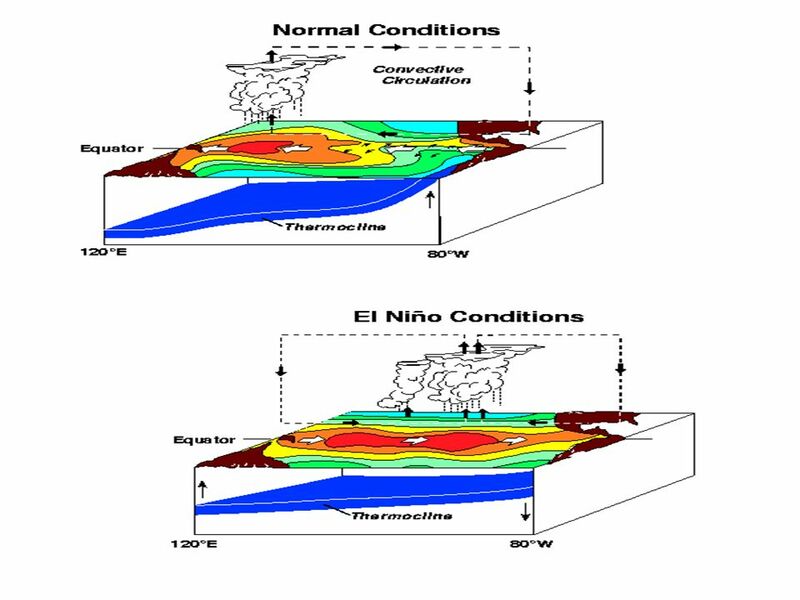 Class #16 Monday, October 4, 2010 Class #16: Monday, October 4 Chapter 8 Oceanography and El Niño/La Niña/ENSO 1. 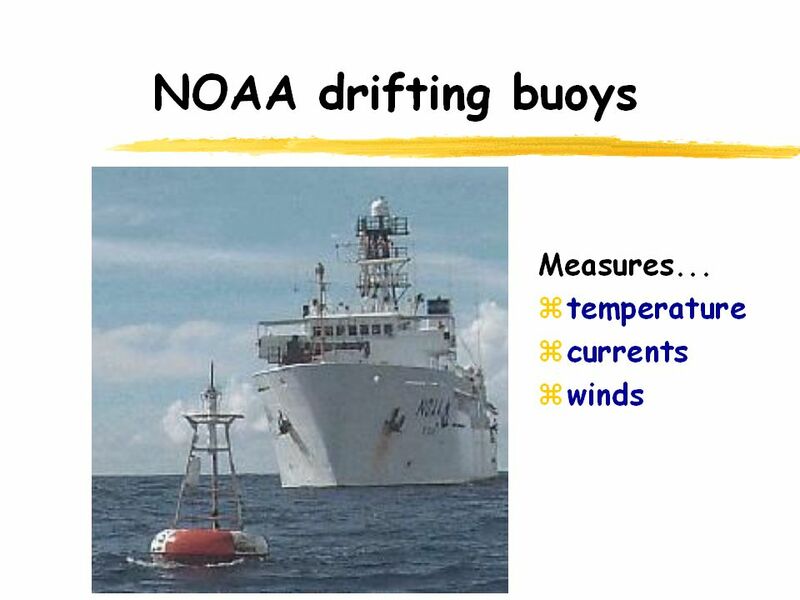 MET 10 Lecture 9 Global Winds, Air Masses, and Fronts Chapter 8 & 9 Dr. Craig Clements San Jose State University. 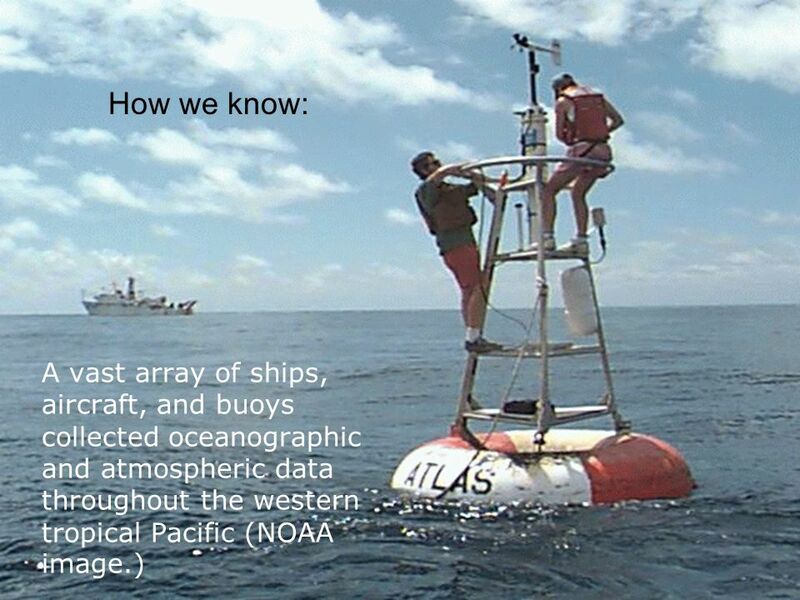 Chapter 5—Part 1 Ocean Circulation/ Upwelling Zones/ El Niño.